← Snow Blindness in Dogs . . . in Dallas? As I type this blog on an early Saturday morning (yes, 8 a.m. is early for me) a finch just landed on the window immediately in front of me, giving me an enviable view of his slightly yellow underbelly. This might not sound at all that terribly exciting, but there is actually no pane or landing area, so to speak, outside this window. The finch was grasping the window screen for several minutes, it seemed, peering into my kitchen. Quite an unusual occurrence, even though I feed the wild birds regularly. Thus, I take this as a sure sign I made the right choice in my blog title! 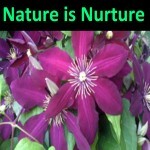 Speaking of natureisnurture.net, I’d like to tell you a little more about what I envision this blog will bring to you. My goal is to share with you the peace and beauty of nature; peace and beauty that is here for you 24/7 no matter your current circumstances. Peace and beauty that is absolutely free. What do I consider to be “nature” or “natural?” Anything that nurtures your soul. It is our relationships with family and friends (present and loved ones passed), our pets, flowers, trees, seashells, birds, fish, rocks, etc. It is our experiences with new places and new faces. It is finding meaning, joy and yes – humor – in everyday life. So, I hope you choose to subscribe and join me on my journeys – present, future and past.